UTrader is a relatively late entrant into the binary options online market. In order to catch up with other more established brands in the industry, it has adopted a marketing method of offering a wide range of bonuses and promotions to pull traders to its platform. This seems to be working, as it has gained a considerable pool of traders in a short period of time. However, questions remain as to whether this will be the path to follow in the long term. Traders who are enjoying these bonuses do not seem to care, as long as they benefit from the company’s robust bonus offering. uTrader is a binary options online brand which is owned by Day Dream Investments Ltd. The company operates from the Marshall Islands and also has a regional office in Riga, capital city of Latvia. The uTrader brand was launched for the first time in 2011 but was recently rebranded. UTrader features mobile apps for iOS (iPad and iPhone) as well as Android devices. These can be downloaded from their respective stores. Trade from anywhere and on any listed asset with your mobile devices. In terms of underlying assets which are available for trading at UTrader, there are more than 160 different types of instruments spread across 4 major asset classes; namely currencies, commodities, Equities and Indices. This is actually a pleasant surprise for us as it is rare for new binary options online brokers to be able to support such a wide coverage of underlying assets. Nevertheless, the fact that UTrader has been able to do that shows that the broker is serious about building up its brand in the binary options online industry. Indices: ASX (Australia), BOMBAY SE, BOVESPA-F, DAX, DAX FUTURE, DOLLAR INDEX F, DOW, EURO STOXX 50, FTSE 100 (UK), FTSE FUTURE, HANG SENG, IBEX 35, IBEX FUTURE, KL FUTURE, KOSPI, KUWAIT, MICEX10, NASDAQ FUTURE, NIFTY, NIKKEI 225, RTS FUTURE, S&P FUTURE, SHANGHAI COMPOSITE, SHENZHEN 300, SMI FUTURE, SSE180, STRAITS TIMES, TADAWUL, TAIEX, TEL AVIV 25, TOPIX , TSX 60, FAZ-SHORT BANKS, NASDAQ, CSI 300, EURO STOXX 50 F, S&P 500. Currencies: AUD/CAD, AUD/CHF, AUD/JPY, AUD/NZD, AUD/USD, CAD/JPY, EUR/CAD, EUR/GBP, EUR/JPY, EUR/RUB, EUR/USD, GBP/CAD, GBP/CHF, GBP/JPY, GBP/USD, NZD/JPY, NZD/USD, USD/BRL, USD/CAD, USD/CHF, USD/EGP, USD/JPY, USD/PLN, USD/RUB, USD/SGD, USD/TRY, USD/ZAR, EUR/AUD. Equities: CL_BRENT, COCOA, COFF_ROB, Copper, COTTON, NGAS, ORANGE_JUIC, SUGAR_W, US_COCOA, USOIL, XAGEUR, XAGUSD, XAUEUR, XAUUSD, XPDUSD. Commodities: COFFEE, GOLD, CORN, OIL (LIGHT SWEET CRUDE), PLATINUM, SILVER, SUGAR, WHEAT. UTrader has adopted the turnkey platform offered by SpotOption, and with this platform comes the opportunity to sign up for any of five possible account types: Bronze, Silver and Gold, Platinum and VIP. When it comes to bonuses, UTrader offers several types of bonuses. For the deposit bonuses, the % awarded depends on the type of account handled by the trader. Bronze – bonus of 50% of account capital. Silver – a 100% bonus. Gold – qualifies for a bonus of 120%. Platinum: – platinum account holders get up to 120% in bonuses. VIP: For a deposit of more than $50,000, VIP account holders get live trade demonstrations, faster withdrawals, interactive sessions with financial analysts and various hedging tools for their trades. There are also screen demonstrations of real-time trading. Risk free trades are available for trades made on the Call/Put as well as Turbo options. The number of risk-free trades that can be enjoyed by the trader as well as the amount that can be provided as cashback in case of a trade loss is controlled by UTrader. “Cash for Turnover” is a compensation plan which provides a cashback for attainment of certain trade turnover milestones. The cashback compensation can be calculated using an online calculator on the UTrader website. Physical gifts are also available. 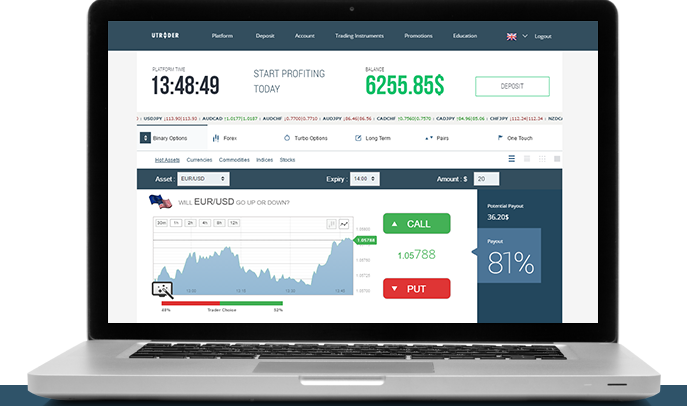 UTrader allows its traders to maintain their account base currency in one of these currencies: USD, Russian Roubles, GBP or Euros. A base currency cannot be changed once it is selected during the account opening process. Credit/debit cards: Transactions can be performed using cards issued by VISA (regular and Electron), MasterCard, Delta, Diner’s Club, and Maestro. The Skrill prepaid debit card can also be used here. Digital wallets are accepted on UTrader. The acceptable digital wallets are those from Skrill, OKPay, Neteller, MoneyNet International and WebMoney. Bank wires using domiciliary bank accounts as well as money transfers from MoneyNet are accepted. The minimum deposit is 200 units of base currency, with withdrawal minimum set at 25 units of base account currency. Only one free withdrawal is permitted in a month. Skype: There is a UTrader Help Desk available on Skype with the username “uTrader.com”. Phone: Get across to uTrader on two phone lines, depending on where you are: +883510008211639 (international) and + 442080773096 (UK). Social media: UTrader can also be reached on Twitter () and Facebook (). Here are some of the special features that traders will find on uTrader. Trade on-the-go with the UTrader mobile apps. A market sentiment bar shows where traders on UTrader think an asset is headed. This displays market bias which some traders use to set their trades. View the earnings and trades of UTrader’s top 5 traders. 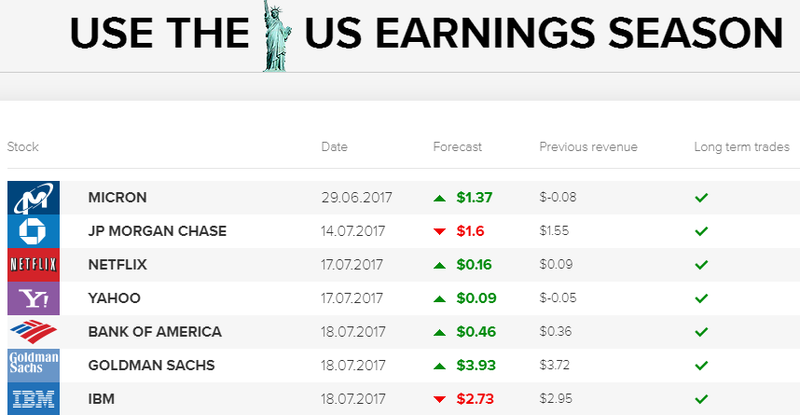 Trade the US earnings seasons using the schedule created on UTrader for this purpose. UTrader is an upcoming brokerage, but it has some aspects of its operations that must be sorted out before it can start to challenge some of the industry leaders. UTrader’s owners need to start working on securing licensed status from any of the recognized binary options online regulators if it is to gain traction among the expanding pool of traders. Turnkey platform is easy to use and presents many trade types. Generous bonus structure in place. Some binary options online robots are compatible with the UTrader platform. Withdrawals are not free. Any withdrawal after the 1st one in a monthly cycle attracts a charge of 12 units of base currency. The brand is not regulated. Any capital lost in the first few trades is returned by UTrader to the tune of 100% of invested amount. These trades are known as risk-free trades and are used to help the new trader gain some market confidence as well as get a feel of real money trading. What are the payment methods supported by UTrader? UTrader offers the use of cards, digital wallets and bank transfers as the three major channels of depositing and withdrawing funds. At the moment, UTrader is not licensed in any jurisdiction. 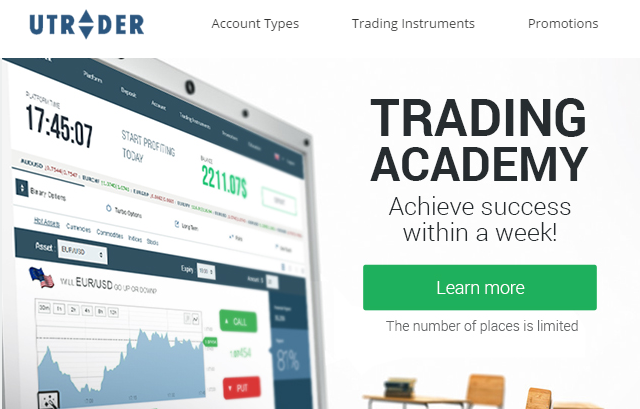 Can I get expert analysis on UTrader? Expert analysis on UTrader is available on the high-end account types such as the Platinum account and VIP account. How can I trade with the US earnings season? A schedule of US earnings releases is provided to enable you trade US stocks as binary options online at the appropriate time. I am a US citizen. Can I trade on UTrader? The current laws in the US on binary options online do not allow UTrader to accept US citizens on its platform. I prefer to trade long term. Is there any trade type that can enable me do this? UTrader features the Long Term trades, which allow you to set expiry times that are as long as 1 month. That way, you avoid intraday market volatility and have a steady ride for as long as a month.